137 cm/54” distance between pulleys allows users to perform traditional crossover movements and a multitude of unilateral and bilateral pressing/pulling movements. Each 106.6 kg/235 lbs stack starts with 1.1 kg/2.5 lbs plates for ultra-light starting resistance and provides up to 53.3 kg/117.5 lbs of applied resistance with a 2:1 pulley ratio. Stability handles conveniently pivot into neutral position when not in use. 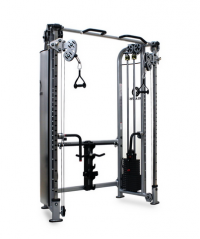 137 cm/54” distance between pulleys allows users to perform traditional crossover movements and a multitude of unilateral and bilateral pressing/pulling movements. Each 181 kg/400 lbs stack starts with 9 kg/20 lbs plates for ultra-light starting resistance and provides up to 100 lbs of applied resistance. 4:1 pulley ratio allows for explosive movements. Stability handles conveniently pivot into neutral position when not in use. A complete lower body conditioning unit, the Pup Sled improves leg, hip, and core strength. Utilizing a fully-welded steel frame, our Pup Sled is lightweight in size, but a true heavyweight in the field, offering variable pulling resistance based on the amount of iron or Olympic bumper plates loaded on the 14” plate post. The Dynamic Power Sled is a great way to increase explosive power and acceleration for serious athletes. A complete lower body conditioning unit, the Power Sled improves leg, hip, and core strength. Constructed from high strength steel, our sled features a rock-solid, fully-welded frame with skid plates for long-lasting durability on any surface. Three different grip positions combined with optional pavement skis combine to create a hugely versatile training system. The Dynamic Hi-Lo sled allows multiple adjustments for different variations of sled workouts. Allowing easy adjustment from low to high push height, the High-Low sled accommodates power and speed training for users of all sizes. 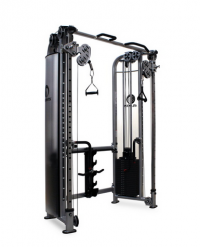 Features include a 14″ high plate post to accommodate either traditional iron plates or Olympic bumper plates, wide stabilizing harness hooks, and beefy skid plates for long-lasting smooth push and pull resistance.